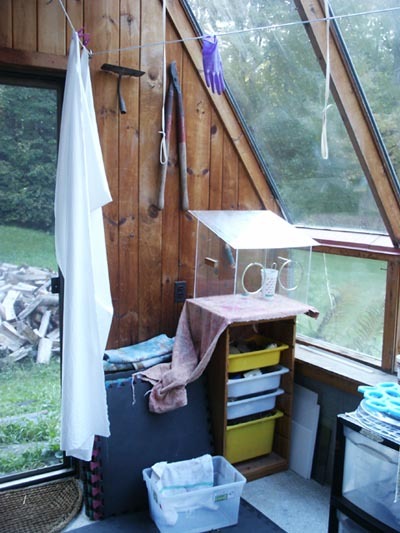 I've recently set up a dyeing studio in what was built as a greenhouse. There's (obviously) lots of light, and I expect it will be warm enough on sunny winter days. 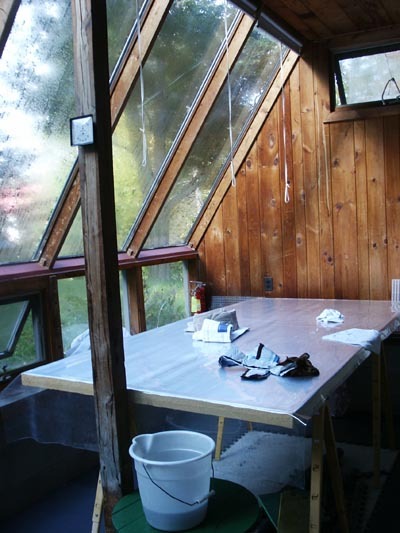 There are shades which can be pulled down over each large glass window. In warmer weather, these help some with excess heat, but I'll probably set up an outside dyeing area as well. 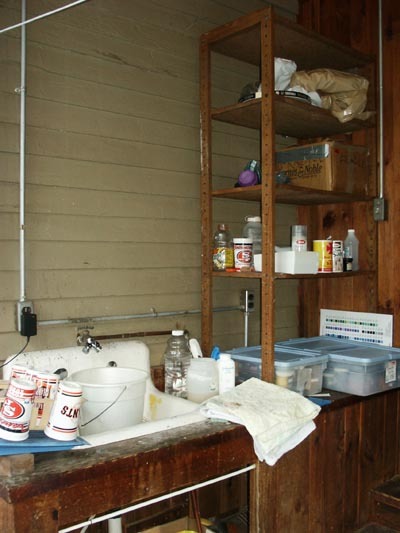 Above, you see my dye table. It's simply a 4' x 8' piece of rigid foam insulation, draped with a nice thick piece of vinyl. Without the post, I'd have more room around the table, and some day I'll try to figure out whether it's really necessary (I'd rather deal with a post than a collapsed roof!). Below you see another section of the room, with some of my storage. The plexiglass box with the slanted top is where I mix my dyes (turning powder into liquid); if I dampen the towel on the bottom of the box, there's very little exposure to the dye powder. I've strung several clotheslines up, and covered the concrete floor with a wonderful dense foam. To the left is a picture of the sink area (and more storage!). I'll probably have to turn the water off in the winter (so the pipe doesn't freeze), but I can always bring a bucket in from the kitchen, which is right next door. If you'd like to see the studio where I put these fabrics to use, click here.